Ava T., Age 13 yrs., Take 7! excited to be modeling again at East Coast Starz 7 since my experience at East Coast Starz 6 was AMAZING! Upon arrival I met with Lauren Handler, the director of East Coast Starz. She is so nice! Percy was there too – one of my favorite people at East Coast, she is very sweet and helpful and amazing with all of us girls. I registered and immediately went over to the store and my mom bought me the exclusive East Coast Starz blinged out two piece “model” sweat suit before they sold out! My mom then bought a raffle ticket, and we were directed to go see Stacie Fitzgerald at the “Fitz’s House of Style.” I know Stacie from her adorable daughter Paige who I love so much! Paige is a top model in NYC so Stacie really knows her stuff. Stacie had a gorgeous outfit for me to model in for my sponsor outfit. 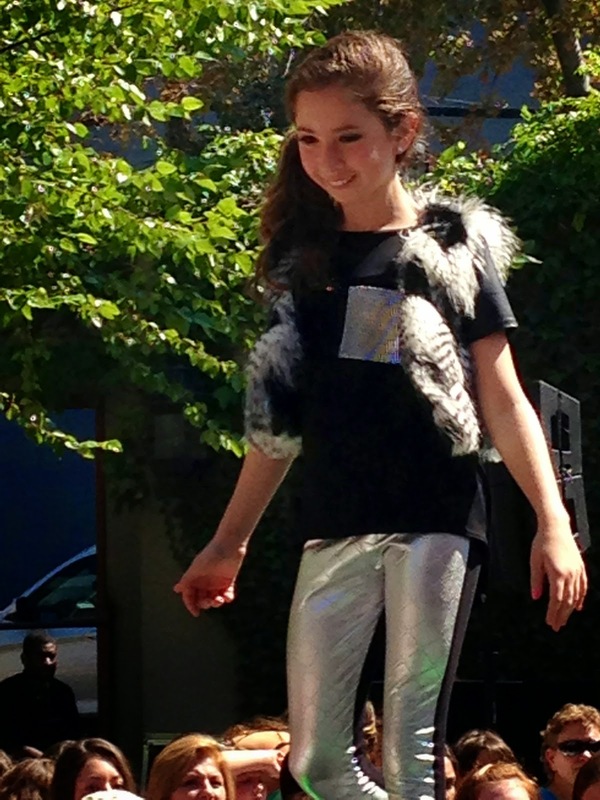 I was then given the outfit from our Diamond Sponsor Outerstuff for the Teen Runway Showdown. When Stacie opened up the box and gave me the Brooklyn Nets shirt, I just screamed! That is my favorite team so I know that a little luck was on my side! 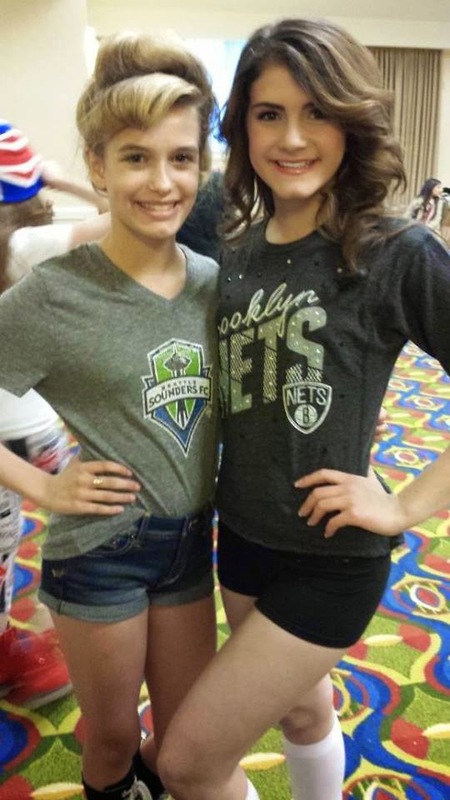 Outfits from Outerstuff... Brooklyn Nets are my FAV team! After that it was time to meet with my team and practice before hitting the stage in our gorgeous destination outfits. Our country was Dubai! My mom bought me a caftan on ebay and we altered it to make it more modern. It was an incredible outfit and I was ready to strut down the runway. I had so much fun meeting and bonding with my team. All the girls were so nice and friendly and we had a great time. At Starz 6 I was interviewed by Shirley Grant Management and was chosen for the callback so I did not go to the interviews this time, but my friend Andora from my Dubai Team got called back to meet with Shirley Grant so I was VERY excited for her! East Coast Starz opens so many doors! Funny Face Today was also represented at Starz, they are a top modeling agency in New York City. We then went to our group photo shoot with Olesja Muller and that was fun and amazing. I felt as though I was in New York on a modeling gig! We then went directly into our individual photos with Child Essence Magazine and Alexi Kilmer -- her photos are always so gorgeous. My mom had to order extra pictures!!! My mom loves East Coast Starz for the memories she gets from all the beautiful photos. After the photo shoots we had a scavenger hunt and we all laughed and ran around like crazy trying to win the game. Afterwards we went to the party – Stacie always has the best parties at her pageants. We danced and talked and everyone was so excited about the competition the next day! Day 2 arrived and everyone was very excited. After hair and makeup, it was time to walk the runway in our themed destination outfits. It was so awesome to see the different outfits for each destination country. The time came for Team Dubai A to show our modeling abilities and walk the runway in our themed outfits! We each showcased our outfits and then came back for an encore walk. One of my favorite things about East Coast Starz is being able to walk the runway, wear designer clothes, mingle with acting agents and top modeling agencies. Once we finished modeling we then got ready for our sponsor showcase! My outfit was the cutest blue and hot pink skirt and blue shrug. Team Dubai A modeled together again in this portion of the competition, but this time we were only judged on our encore so we made sure we practiced, and focused on that. Once the showcase was over, I got ready for the optional "Pose Off" competition, one of my favorite parts of the competition. I had so much fun doing the Pose off, I was given the cutest blinged out shirt at registration to wear for the pose off. One of my best friends Dominique Rivera won the Pose Off!!!! Rocking the runway for Outerstuff! As soon as the Pose Off competition was over, it was time for the Teen Runway Showdown sponsored by Outerstuff. This is where I got to wear the Brooklyn Nets shirt. I also added a basketball to model with my outfit and I guess that must have impressed the judges because I won!!!!! I was over the top excited! 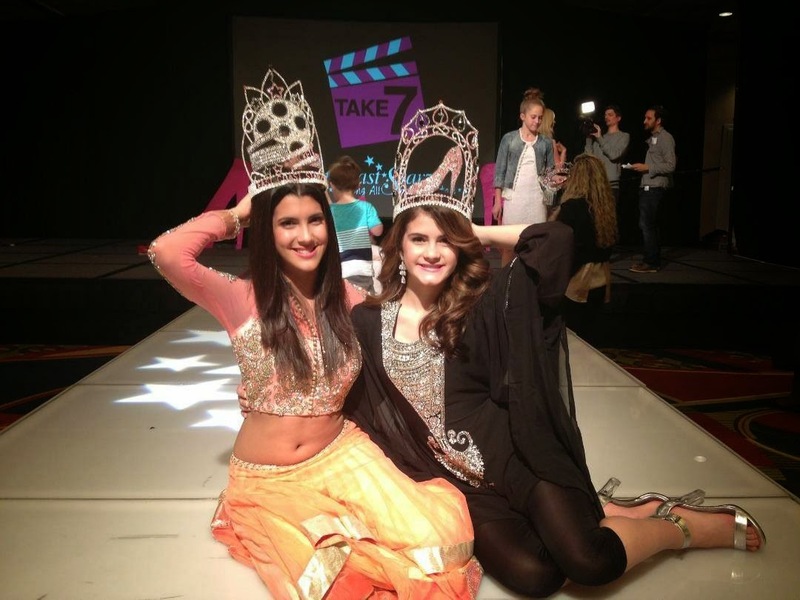 Ability” so we were very happy to have been recognized for our modeling – I thought our team rocked it! Last but not least…. remember when I told you that my mom bought a raffle ticket? Yessssss, I won that too! I won a Pink Limo ride, I won a Bebe’s track suit valued over $300, I won a Juicy Couture outfit and a fashion bag filled with goodies!! East Coast Starz was a weekend I will never forget. Thank you so much Lauren and Stacie! Avana H., Age 4, East Coast Starz Take 7! I must say I really enjoyed myself at my first Starz's event, my daughter was so excited about rocking that runway and showing off her cute outfits. She loves making new friends and having fun! She really enjoyed the scavenger hunt and getting to run around the hotel, but I believe the highlight for her was the party, she loves to dance and she got to meet Elsa and Anna. That just made her day and night she's still talking about that moment. We cant wait for Take 8! Thanks to Lauren and Stacie for a great weekend. Shout to my team NY B moms it was great meeting you ladies and I hope to see you again! Me and my BFF Lila! Best time I have ever had with East Coast Starz (and there have been lots! Pink Hummer anyone?!) was walking the runway during New York Fashion Week! My mom, my two friends Lila Goldstein and Sophie Ostrove and I all piled in the car and arrived at Studio Square in Long Island City. I met Booch O'Connell in line. 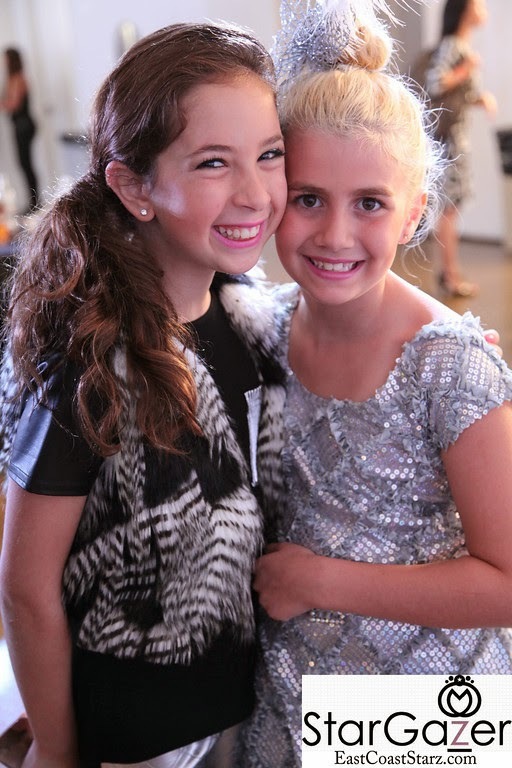 We had met before at Take 4 and we became really good friends chatting about how much we loved fashion and Dance Moms! Inside, super stylist Stacie Fitz quickly picked out an awesome Les Tout Petit outfit for me: a rocker chic look with silver leggings a black shirt and a furry vest. The outdoor stage and runway was huge, and there were so many people watching and cheering for us! With the cast of Dance Moms! I loved strutting down the runway and striking a pose. At the end of the day I got to hang with Chloe, Paige, Maddie, Kenzie and their moms from Dance Moms. We took tons of pics and they signed autographs for me. It was an amazing experience from start to finish--the only kind you get at East Coast Starz!!! 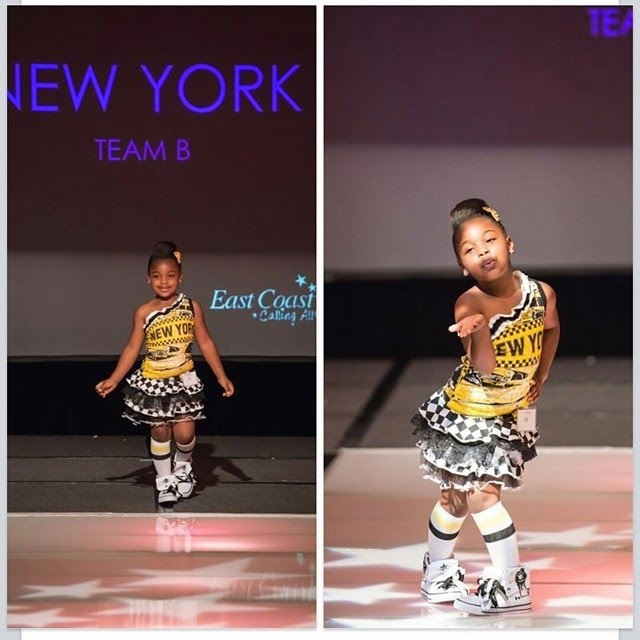 East Coast Starz, a leading producer of unique fashion experiences for girls, is gearing up toward its flagship event, Take 8, which will take place November 15-16, 2014, in Whippany, NJ. 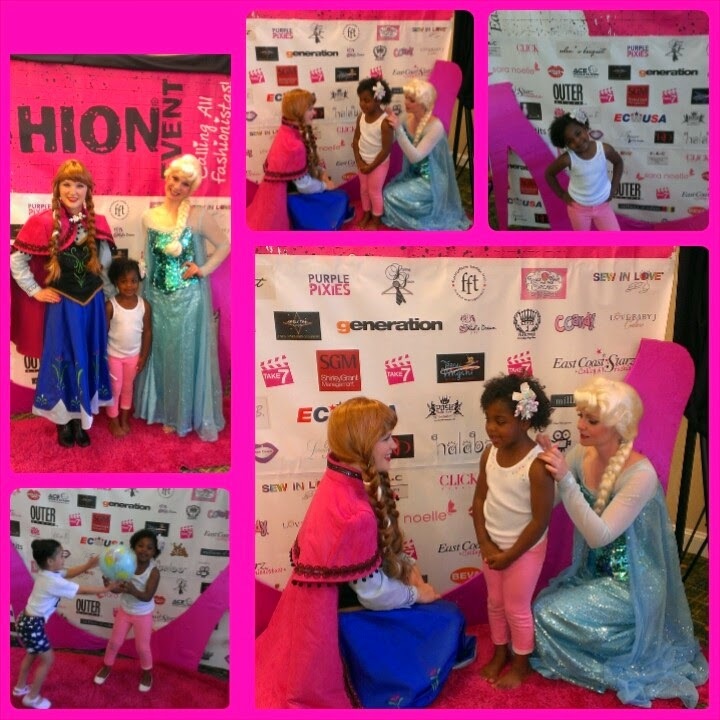 The yearly event unites girls ages 2-16 in a weekend full of fashion, style, fun, photo shoots and runway shows. East Coast Starz is a program created to help both parents and children become educated and involved in the fashion industry. The program holds two competition events a year, with little pop up “Runway the Fun Way” every month. The show allows children between the ages of 2-16 to discover and bring out their inner star qualities so they can shine brighter on the outside. We build up the self-confidence in children and pave their road to success. We bring in top NYC agents, managers and scouts to sign new talent and start careers, We invite designers and stars to talk to the girls, inspiring them that dreams can come true. We believe that the runway builds confidence, and strengthens a child’s self-esteem in her most important formative years. Additionally, our program provides a venue for girls to share common interests and lifelong friendships! East Coast Starz 2014. Simple theme. Powered by Blogger.